Celebrating Chinese New Year as we ring in the Year of the Pig has awakened a distinctively creative impulse in the Cinco Jotas community. One highlight has been the creation of a visually striking image that unites the brand with this revered festive Chinese tradition. 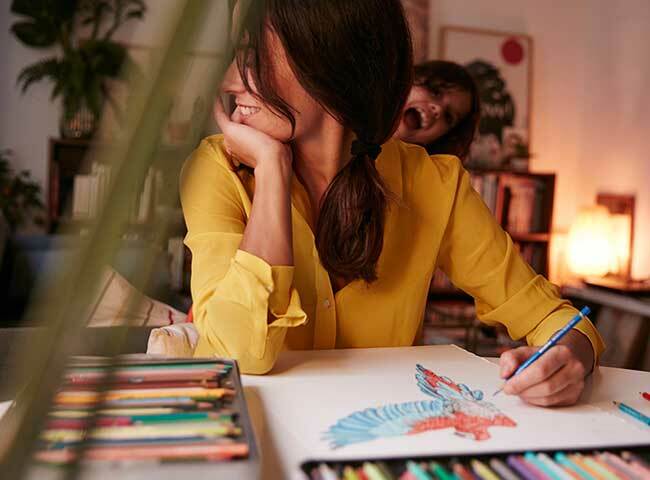 We are fortunate to have the expertise of one of Spain’s very best illustrators, Carmen García Huerta. An international reference point in her profession, her works have appeared in prestigious publications around the world, from L'Officiel Russia and Japan, to Vogue Spain, Cosmopolitan France and Glamour Germany. In the following interview Carmen García Huerta details how she tackled this unique artisan project for Cinco Jotas. What was your source of inspiration when creating this magnificent commemorative illustration for the Year of the Pig? Cinco Jotas provided me with a large amount of background information, so the inspirational triggers were quite clear from the start. It started with the world of the Spanish meadows, or “dehesa” in Spanish and the indigenous acorn-fed 100% ibérico pigs. These were combined with the festive new year reference points of the East. Both, of course, were very stimulating. The real challenge was in honouring those two universes that on the surface are quite distant and diverse, and merging them together in harmony. What criterion did you use to choose the colour schemes and the style of the illustration? The style of the illustration is purely change to my own. I felt quit eat ease because Cinco Jotas gave me complete creative freedom. It is an absolute pleasure to work with a client that trusts your artistic style without constraints. The palette is similar to my usual tones; we were able to rely a lot on both the natural colours of the Spanish meadows and the vibrant colours typical of the Chinese New Year celebrations, especially the reds and golds. What messages about Cinco Jotas would you like the consumer to register when admiring this illustration? 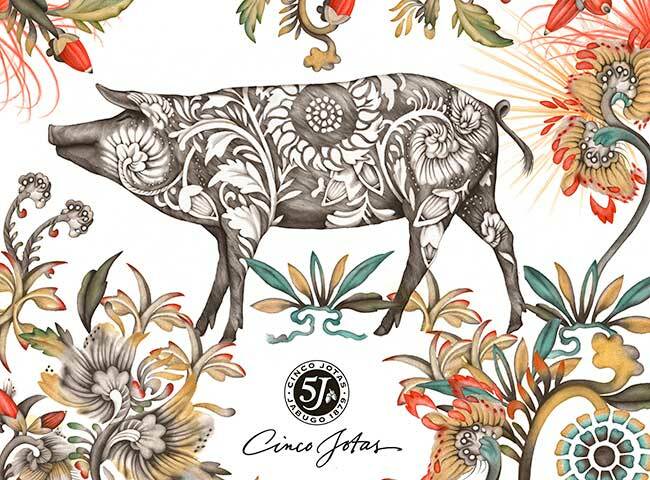 I would like to convey a taste for tradition and artisan expertise, since both Cinco Jotas as a brand and my illustrations share these qualities. I’d also like to lead the observer into a sensory world filled with sensuous pleasures and joyous celebration. Finally, how would you define your creative process? How do you deal with a blank page at the start of a project? There is always an initial moment of "necessary panic", the very one that ends up energizing me to get started. The first part is always the most difficult: when you have to manifest a few ideas on paper without a complete understanding of how to approach it. It’s during this time that I tend to look at a lot of photos, document what I observe, and compose in my head a bit of "cut-and-paste" structure of what the final result may end up becoming. The intermediate phase is also complicated, because you have to compose online all these creative thoughts swirling around in your head. Although at least by this time I tend to have a solid vision of what I intend to do. 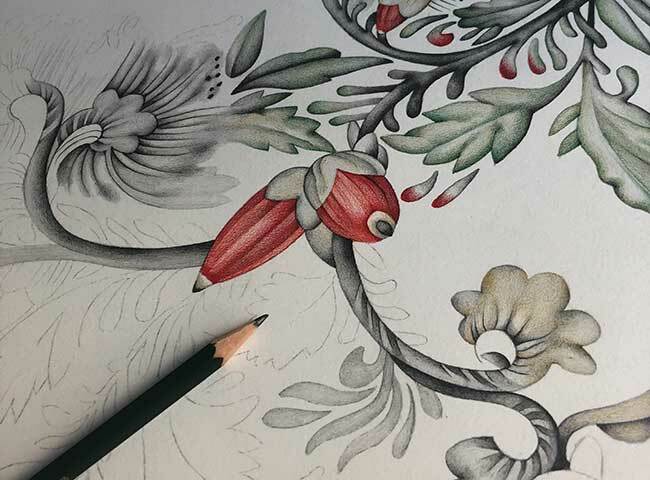 And, finally, the most pleasant part: the execution of the project, fine-tuning the drawing with all the intricate details and array of colours. This is the part that I deeply enjoy.